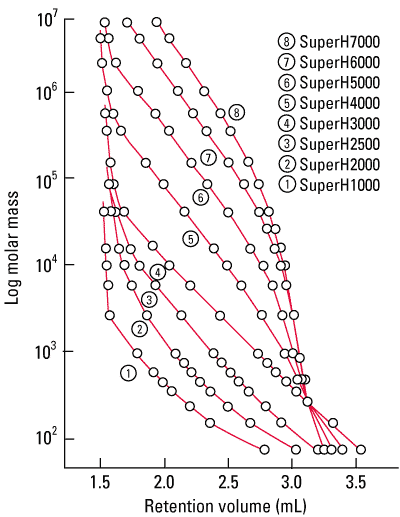 The TSKgel SuperH column line consists of eight columns with different pore sizes, TSKgel SuperH1000 through TSKgel SuperH7000, and four columns with an extended linear range of the calibration curve. The calibration curves are shown below. TSKgel SuperH columns are high efficiency/high throughput versions of the conventional TSKgel HHR columns. The TSKgel SuperH columns are 6.0 mm ID x 15 cm. They are ideally used with EcoSEC GPC systems which are optimized for semi-micro SEC/GPC applications. Maximum operating temperature for TSKgel SuperH columns is 140 °C. Broad solvent range. All TSKgel SuperH columns are shipped in THF, which can be exchanged for a wide variety of organic solvents, as shown in the Table below. The volume of a TSKgel SuperH column is 3.4 times smaller than that of a conventional 7.8 mm ID x 30 cm column. As a result, peak volumes will be proportionally smaller on TSKgel SuperH columns compared to a corresponding TSKgel HHR column. Thus, your HPLC system may require optimization of components that can give rise to extra-column band broadening, such as connecting tubing, injector, injection volume, detector cell volume, and detector time constant. The TSKgel SuperH product line contains four mixed bed columns, in which particles with different pore sizes are blended to provide an extended linear calibration curve. 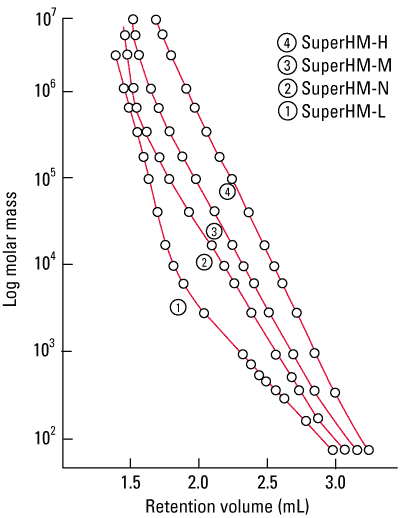 The mixed bed columns feature increasing linear calibration ranges, from TSKgel SuperHM-L, SuperHM-N, SuperHM-M, to SuperHM-H.
All TSKgel SuperH analytical columns are shipped containing tetrahydrofuran (THF). ** TSKgel H-type columns may be specially ordered with this shipping solvent.